Written by Suppya Helene Nut. 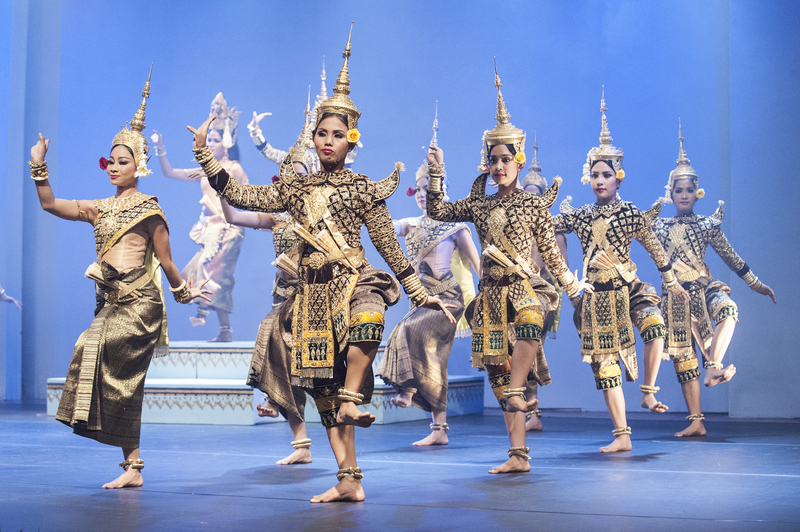 The Royal Ballet of Cambodia is a form of theatre established in the royal courts of Cambodia. Its aristocratic background is evident in its refined and highly symbolic dance gestures. From the outset, this theatrical style was highly ritualised and used to celebrate royal ceremonies that served to establish the authority of the courts. Its centuries-long association with the monarchy gives it a peculiar characteristic: all its artists are traditionally female. It was only in the middle of the twentieth century that male artists were introduced. Along with Cambodia’s intellectuals, the educated and the urban populace, as many as 90 per cent of the dance practitioners perished from disease, overwork, starvation and slaughter. Traditionally, the royal troupe’s repertoire included stories that originated from Hindu and Buddhist legends and myths. In the nineteenth century, performances could last several days and short pieces of ballet or comic scenes were inserted as a distraction for the king and the audience. In the early twentieth century, the French colonial authorities commissioned the royal troupe to perform at the 1906 Colonial Exhibition in Marseilles, which formed part of the official visit by the newly crowned King Sisowath. Performances were held in three cities including Paris, and the tour was a tremendous success. The celebrated sculptor, Auguste Rodin, who was fascinated by the performance at the Pré-Catelan in Paris, took the train down to Marseilles and spent three days with the dancers. By the time the troupe left, he had drawn more than 200 portraits. The success of the royal troupe served to legitimise France’s presence in Cambodia as both protector of the monarchy and patron of the arts. When Cambodia gained its independence in 1953, the royal troupe was on the verge of extinction. Despite the success of the 1906 tour, the effect of the Depression, followed by the Second World War, had resulted in a drastically reduced budget for the Palace, and many dancers had left as a consequence. In the early 1950s, Princess Kossamak, the mother of King Sihanouk, took it upon herself to reorganise the royal troupe with the few dance masters left. As a princess she had learned to dance, and her expertise in both music and dance was recognised by the artists. She not only re-designed the costumes and ornaments, but she also revisited the old repertoire, as well as engaging in new creations. She had the skill to nurture new talents and supported masters to create new pieces of ballet. A number of ballet recitals performed today originate from this period, such as the well-known Apsara Dance and Tep Monorom. 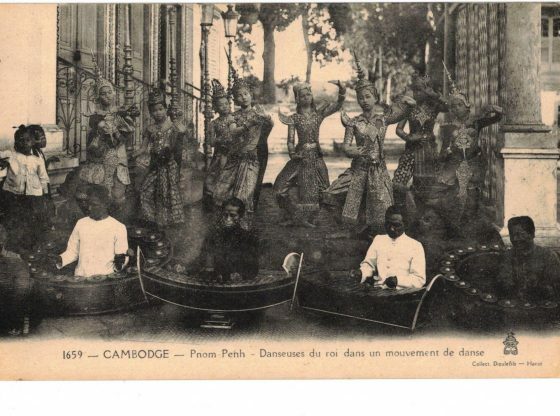 Following independence, the royal troupe was re-named the Royal Ballet of Cambodia, and it became an instrument for the Cambodian monarchy to gain recognition on the international political scene. To accompany King Sihanouk’s efforts, the Queen Mother Kossamak promoted pieces that were shorter than the traditional ballet stories and choreographed them to fit onto Western stages. Even the famous Reamker (the Cambodian version of the Ramayana) was shortened to around one-and-a-half hours (previously it had taken place over several days). The royal troupe performed regularly to greet delegations from various countries and dance tours were organised abroad to show the refinement of the independent Cambodian state under the leadership of King Sihanouk. The coup d’état of 1970 saw the end of the monarchy and the imposition of a Republican regime. The new regime was characterised by a narrow nationalistic vision, professing an ideology referred to as ‘the essence of ‘Khmerness’, which stressed Khmer ethnic traditions (Khmers represented 90 per cent of the country). This dogma tried to emphasise the superiority of the Khmer people by highlighting their Mon heritage (the Mon are an ethnic group native to parts of Myanmar and Thailand, and one of the earliest peoples to reside in Southeast Asia). The Republican regime used its ideology to stress the anteriority of the Khmers and Mons before the ‘intrusion’ of the Thai and Vietnamese peoples. Under the Republic, folk dance was given as much importance as royal dance. The ballet was formally detached from the royal palace to become one among several folk disciplines taught at the re-named University of Fine Arts. The former Royal Ballet became the Classical Ballet and ‘classical dancers’ were mixed with folk dancers. Thus, a new concept of ‘classicism’ borrowed from the West made its way into the Cambodian language to identify royal dance as part of the nation’s ‘traditions’, removing its monarchical origins. As part of its propaganda, the Republican regime used a new medium mainly found in Phnom Penh: television. Along with folk dances, many ‘classical dances’ were televised and most of the urban populace grew accustomed to seeing these art forms. This period, although short-lived (just five years), was successful in the wide dissemination of what became known as ‘Khmer heritage’, illustrating the ‘genius’ of the Khmer people. After defeating the Republican regime, the Khmer Rouge came to power in 1975. Any form of traditional culture was then banned in order to build a ‘new society’. Along with Cambodia’s intellectuals, the educated and the urban populace, as many as 90 per cent of the dance practitioners perished from disease, overwork, starvation and slaughter. The fall of the Khmer Rouge regime in 1979, following the victory of the Vietnamese, created a situation of chaos in Cambodia. A significant number of Cambodians fled their country. Some settled in Western countries such as France, the US, Canada and Australia, but the majority of the refugees were found in camps built along the Cambodian-Thai border (around half a million people). It was a traumatic period in which Cambodians witnessed a devastated country, the loss of parents and relatives, and the near annihilation of their culture. People felt the need to ‘do something’ and many established associations and other private initiatives to preserve what was left. Dancers, as well as ordinary citizens, mostly women, were the first to take steps towards the revitalisation of the art of dance. This work was done both in and outside the country. Even among the most isolated communities, the creation of a small dance troupe was as much of a priority as building a Buddhist temple, and this same phenomenon also occurred in the refugee camps along the Thai border. A small number of survivors returned to Phnom Penh and eagerly started to train a new generation of performers who, in the following years, began to tour the country. Royal Dance or Classical Dance is now one of Cambodia’s most enduring art forms. It is a living testimony to a potent cultural heritage. Originally seen as an elitist performance art confined to the royal palace, it has become emblematic of the nation as a whole. Royal Dance is a real example of how shattered communities can reconstruct a new collective vision from their own past. It is an art form which, following years of suffering, has become a source of identity, rebirth and vitality, transcending political parties across Cambodia. In 2008 the Royal Ballet of Cambodia was inscribed onto UNESCO’s Representative List of the Intangible Cultural Heritage of Humanity. Suppya Helene Nut is an Associate Lecturer at the Institut National des Langues Orientales, Paris, and at the University of Cologne. 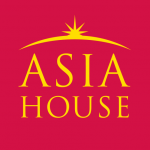 She teaches the history and performing arts of mainland Southeast Asia. She supervised and directed the Khmer Dance Project (2008–2012) initiated by the Center for Khmer Studies in partnership with the Jerome Robbins Dance Division of the New York Public Library. She is currently documenting the choreographic works of Princess Norodom Buppha Devi. Image Credit: Courtesy of Suppya Helene Nut.